Your home's exterior doors contribute significantly to your home's overall curb appeal. There are a variety of exterior door different styles and materials from which to choose. Your exterior doors keep you secure and snug in your home. They can also make a big statement about your own tastes and style. In order to find both a beautiful and long-lasting exterior door, it's important to find a balance between appearance and energy efficiency. Exterior doors refer to front doors, as well as patio, deck, and porch doors, side doors, and garage doors. Popular styles for front doors include additions such as sidelights (glass panels on either side of your door), transoms (glass panels above your door), and glass inserts embedded in your door. Popular styles for patio, deck, and porch doors include sets of double french doors and sliding glass doors. For homeowners living in regions with extreme weather, such as hurricanes and blizzards, storm doors are popular to better protect the front door. Homeowners have many material options to choose from when shopping for exterior doors, from traditional solid woods to aluminum, steel, and fiberglass. Exterior doors made using solid wood are elegant and snug, though more susceptible to damage from the elements when compared to other materials. Steel exterior doors tend to be inexpensive and durable, though perhaps less stylish than other choices. Fiberglass can imitate the look of real wood, and this material is both extremely durable and low-maintenance. Aluminum doors are durable and are popular choices in coastal areas that experience stormy weather. In terms of the energy efficiency for your exterior doors, different material options are measured for their insulation value. Your exterior doors' R-value determines their thermal resistance: the higher the R-value, the greater the door's energy efficiency. Since glass tends to be a poor insulator and loses more heat, glass patio doors or front doors may have an R-value as low as R-1. By using more efficient materials like steel or fiberglass however, it's not uncommon to see exterior doors with R-values anywhere from R-3 to R-6. 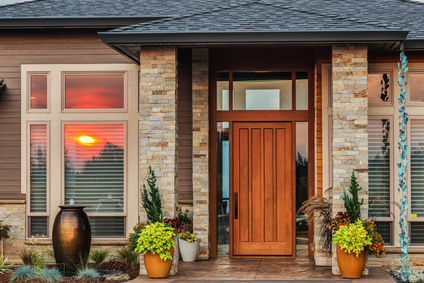 For more information on exterior doors for your home, check out our convenient articles on exterior door styles, materials, costs, repairs, maintenance, energy efficiency, and more.